This card is designed by Stephan Classen, aka drakk2, who is a huge Orothe fan. The simplicity of the card might seem to lend to the illusion that the card is under-designed, but that is not so in Orothe. 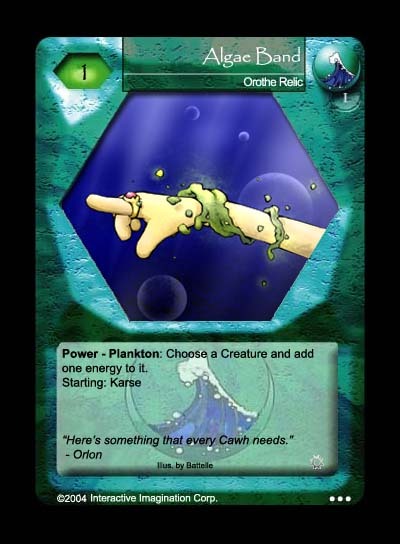 In addition, this card does not discriminate against the region of the creature, it adds one energy whatever region the creature is from. Add to the fact that the cheaply costed relic, it is guaranteed to add at least one energy every turn when Orlon's ring is in play. It starts on Karse to enable his Cawh to grow some, but playtesters have used this ring more effectively with the Abaquist and the old school O'qua to steal a 4e creature. The artwork is done by BlueFurok forum member Vompok.